Widmann, Richard H. Crawford, Sloane Kurtz, Cassandra M. Nelson, Mark D. Miles, Patrick D. Morin, Randall S. and Riemann, Rachel 2015. 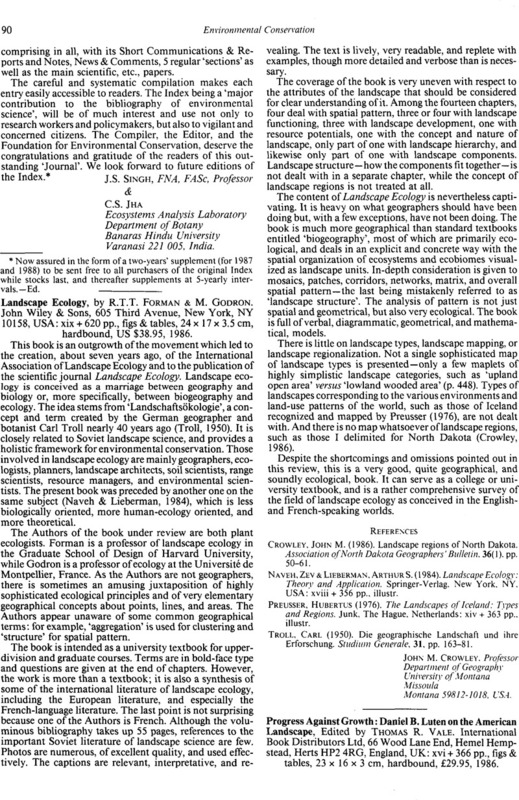 Landscape Ecology, by R.T.T. Forman & M. Godron. John Wiley & Sons, 605 Third Avenue, New York, NY 10158, USA: xix + 620 pp., figs & tables, 24 × 17 × 3.5 cm, hardbound, US $38.95, 1986. Department of Geography, University of Montana, Missoula, Montana 59812-1018, USA. Crowley, John M. (1986). Landscape regions of North Dakota. Association of North Dakota Geographers' Bulletin, 36(1), pp. 50–61. Naveh, Zev & Lieberman, Arthur S. (1984). Landscape Ecology: Theory and Application. Springer-Verlag, New York, NY, USA: xviii + 356 pp., illustr. Preusser, Hubertus (1976). The Landscapes of Iceland: Types and Regions. Junk, The Hague, Netherlands: xiv + 363 pp., illustr. Troll, Carl (1950). Die geographische Landschaft und ihre Erforschung. Studium Generale, 31, pp. 163–81.